He didn’t get a lot of work this week- I had the David Sedaris reading when I normally have my dressage lesson, and then he got tranqued (almost wrote tanked!) on Wednesday to get clipped, so it was just a mega-fast ride on Tuesday and then my lesson on Thursday so far this week! (I’m not going to lie- any sort of change in schedule makes me feel SUPER ANXIOUS.) Like, I’m only comfortable with a total break in schedule when I am physically out of the province or something on holidays. Curiously, this applies to my gym-going at lunch- MUST GO. And being at the barn with Oats. MUST GO. If I can’t, and I am still at home doing something else- I feel weird, anxious, worried. I shouldn’t have been worried though- Oats was so good! Cooperative, willing to go forward (not always his strong suit) and jumping very nicely. Me on the other hand- needs some work! haha. We worked on cantering with my hands pressed against his neck in two-point with the purpose of staying very still, and then trotted and cantered a warmup crossrail. 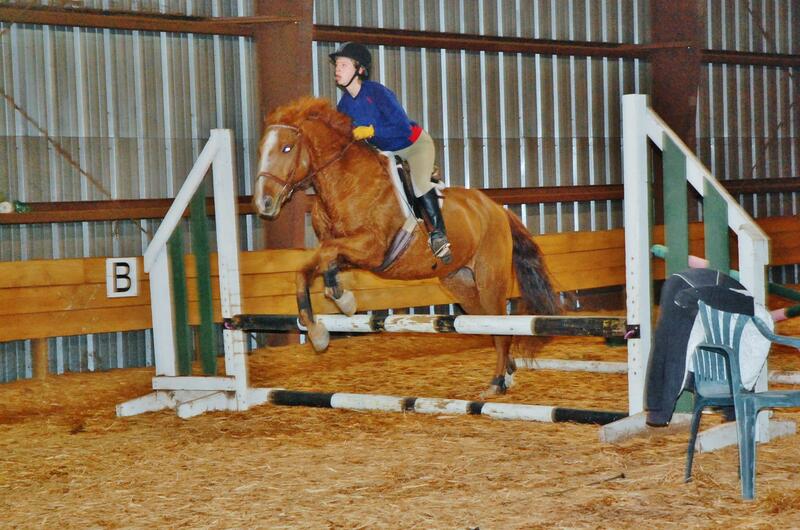 We then moved to a small oxer at canter, and then strung together a small course. I was not feeling great (turns out I have a mild cold or something that causes tiredness, coughing up gross stuff and insane night sweats and day sweats…) so I kept it short and fairly easy with lots of walk breaks. But, I was still challenged! And it’s funny yet AGAIN I saw the jumps set up, and was like hmmm I want to be a bit worried about them (particularly the warm up oxer) but when we ended up working up to it…I didn’t even have anything to say! HA hahah. 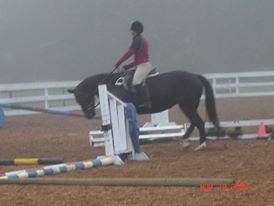 Good: Getting more pace, most distances worked out, our best jump was the small oxer I was initially afraid of warming up. Bravery is getting better but still can be further developed. Visualization is good so far. Needs work: Straightness again, landing on my feet and not in a heap, too-busy hands and stop trying to let my hand do the work around corners. Keep pace going, don’t let it slack off. Do more two-point and don’t sit back and drive- use legs/crop! I was lucky enough to have my husband buy us some tickets to go see David Sedaris do a reading the other day and I LOVED it. His insights (crass, gross, gentle, loving, heartfelt, funny~) really spoke to me. I heard the most bizarre stories I have ever heard, and probably will ever hear in my lifetime. I also had the opportunity to share some pretty dirty jokes with coworkers the next day (shhhh!). He’s so funny, but plays it off in a well-intentioned ‘aw shucks’ kind of way. Like he says, when he’s asked why he has an obsession with picking up trash outside his home in the UK- “People think I’m crazy for doing it, and it’s true it has become my hobby. But this hobby is taking me to Buckingham Palace to meet the Queen!” (He also had a garbage truck named after him, for his service in cleaning up the area). Fabulous night, and having him read those stories, and some new ones, was a great time. I could NOT believe the story about his fatty tumor a ‘lipoma’ as he calls it. He wanted to get it removed, and then wanted the tumor, once excised- so he could feed it to his favourite snapping turtle in South Carolina. The doctor, humorlessly said anything removed from Sedaris’ body was kept by the facility and would not be given to Sedaris. So, David Sedaris left, tumor intact, and shared that story at a reading. A tiny lady came up to him after the reading and said she could remove the tumor and he could have it afterward. She did add that she was a doctor, of course. He took her up on the offer. They went under cover of darkness to a medical clinic across the border to Mexico, and the procedure was done. David was accompanied to her sister’s house, where he got some pain meds, and then at 4am, was on his way to another reading via airplane. His tumor was frozen, and shipped to his South Carolina house, where it could stay frozen ready in time for a Thanksgiving day feast for the snapping turtle. Sadly, when he went to feed the frozen tumor to the turtle, there were only the smaller ‘slider’ turtles left. The snapping turtles were likely hibernating until spring. It didn’t quite ruin Thanksgiving, but it did leave it feeling rather anticlimactic. I believe he said he was going to wait until summer, to feed the tumor. Sports intertwine- Running VS Riding? 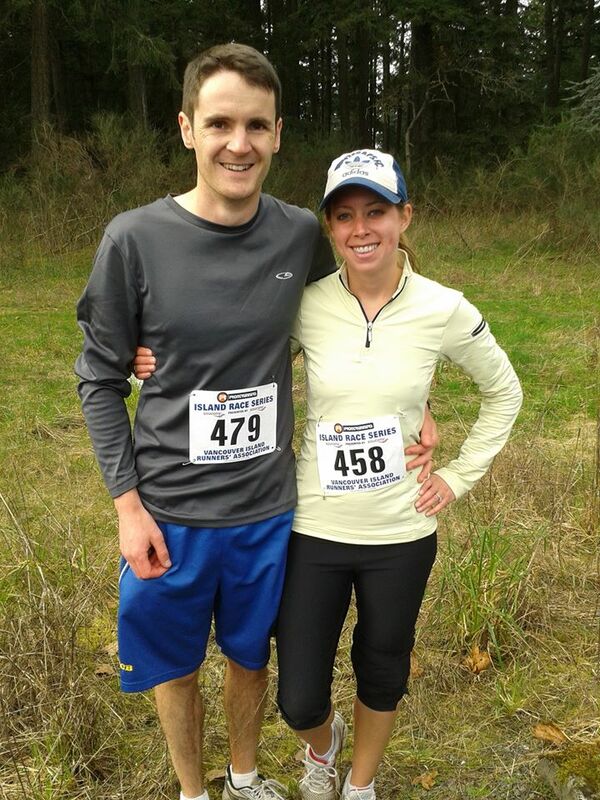 Funny enough I don’t really blog much about running except recently some race reports. Truth is I think it is kind of boring, it’s a boring sport to do, and to talk about (for me, mostly). Probably because I’m not thrillingly fast, and I do find it very disappointing and discouraging. Funny enough in my riding life I am pretty much at the ‘mediocre’ level as well but still LOVE talking about it- to anyone who will listen- aka my blog…HA. (I will use this opportunity to sneak a riding update- Saturday and Sunday we had to do flatwork, which Oats cooperated but was less than sparkly about). He got the fastest tack up-warm-up-ride, including trot cross-rails and canter circles-yesterday of his life!!). Lesson tomorrow, clip job/tranq today. But there is cross-over. Riding is a very mental sport, and so is running. The head game is 90% of the win for both of these activities. One of the easiest mistakes you can make when working towards a fitness goal is feeling ashamed, discouraged or defeated by where you’re at instead of empowered by it. We all have to start somewhere! It doesn’t matter how fast you’re doing it, how long it’s taking, or how far you’re going, it’s the fact that you’re showing up and putting the work in that counts. And sometimes you have to stop to smell the flowers, to take a break and remind yourself why made the goal in the first place. It is very easy to get lost in the process- for both my riding goals/progression AND my running goals. So I didn’t break the top 10 in yet another race- overall, I’m doing fairly well and injury free. That’s a big win! 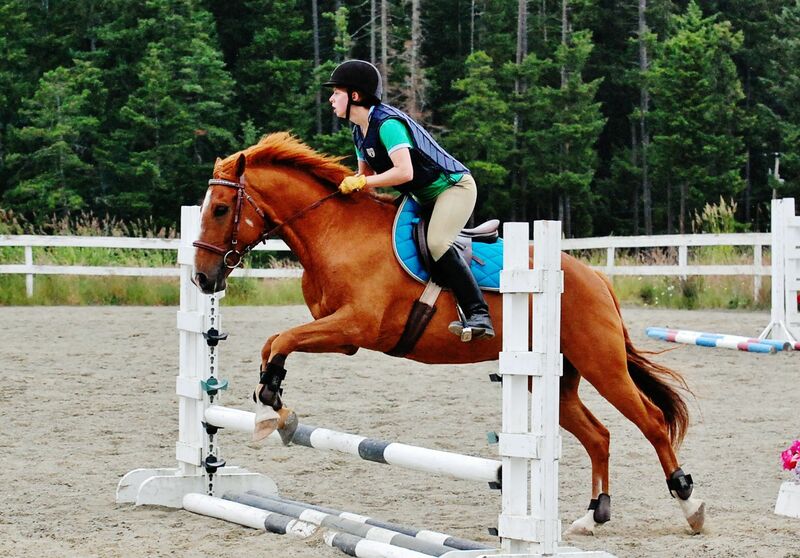 I’m getting more out of my jumping lessons (when fear doesn’t overtake my brain) and by being/starting in a comfort zone, I’m also enjoying them MUCH more. And why do I do these things? I LOVE these sports (well riding, running…I get a weird sense of self satisfaction from. I call it runner’s smug). So yeah we can do it! Go us!! The Arkells were GREAT on Saturday. Personable, happy, and totally ready to rock. They stepped on stage with a great presence and just kept the good vibes rolling. They played all their best hits, and a lot of new stuff too. They knew when to keep the new materials short, and the audience interested. Not that I didn’t like the new stuff, but when you follow a band, you also want them to show their ‘roots’ and history, so to speak. They also relayed a fun anecdote- when they were first touring in Victoria, they played at Lucky Bar (that still exists) and didn’t have a place to crash – being young, broke and free willing, they relayed their sad story and a woman chatting with them offered her floor for the night. They crashed there, and remembered her very fondly, for her generosity and free spirit. They called her out in the crowed, and my husband knew her! He said it was the type of thing she would do, and not think twice about- she was that cool and generous. Great show, and ended with a cover of Diana Ross’ ‘Ain’t no mountain high enough’ with Dear Rouge singing as well. Love it! Highly recommend checking them out, they played to sold-out crowd at Sugar, and wow…You could tell it was sold out, felt like there was barely any breathing room! I was sweating to death! Race Report- What, all 8ks aren’t created equally? 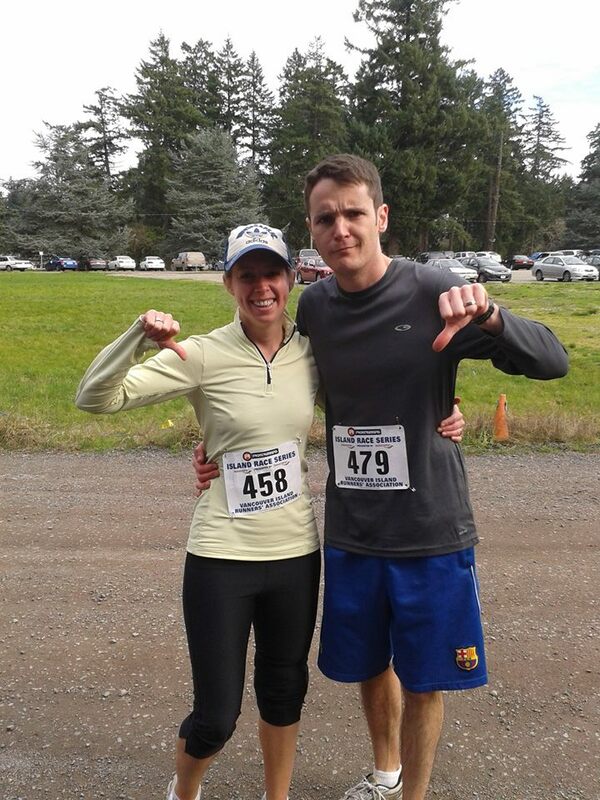 Yeahh….Much to my dismay, the Hatley Castle 8k was NOT AT ALL like the Sannich 8k I ran a month or so ago. Jesus, not at all. My race review: BOO!! It was HARD! I had kind of a sinking feeling when my husband was like, oh yeah I don’t think it’s that hilly, maybe we should try to push for a more aggressive pace, and I was thinking, um, I’ve been a student on that campus and I remember it being VERY HILLY. So, there’s that. The race organizer even had a special announcement- big hill at 2-3km so pace accordingly, doesn’t want anyone blowing their race early! My stomach, already fairly unhappy from my wine/cheese/salami/bread and Arkells concert the night before was even more unhappy with that announcement. We set off, and I immediately fell behind my husband and friend. ARGH. And it just kept going…. And never went down. It leveled out for a bit, and then UP UP UP! For approximately 6km…Even through the woods, which I would normally like! Except this time I felt like I was going to have a heart attack instead. People were gasping, muttering and I heard rumours of a ‘big downhill’ coming. It was a long time coming, and when we finally got to it? It was not NICE, it was more like a 1km suicide run pell-mell headfirst down a gravel road. People went flying down the hill. I had my knee doctor’s reminders echoing in my head- try not to race down hills, it’s tough on your knee, etc etc…I was slower going down that insane gravel run! GAH! In short, we spent a good 6km running uphill, then 1km flying downhill, and then 1km flat running where I had no gas left in the tank. At all. I straggled across the finish line gasping like a fish. I had saliva coated around my lips very attractively. My time was a tad disappointing to me- I was hoping for a better 8k time, but given the literal hell that was this run I guess it was ok: Official bib time of 39:00, but my chip time was 38:52. My last 8k time was 38:40 but heck it was on flat ground, haha. To get better at something, you have to do a lot of it. At least, in theory… So, either intentionally or unintentionally, we have been focusing a lot on gymnastic/gridwork in my jumping lessons on Thursdays. Last week, it kind of sucked but got better. This week I saw the grid was set up again and was like…noo…..
Also there is a lesson before mine, and the funniest thing, but whenever I watch another jumping lesson before I jump, I get all nervous and am like well now I don’t WANT to jump. Or, I anxiously declare that no way are we jumping at that height (and trust me it is NOT high…). And the funny part? We always do end up back at that height eventually! Ah, nerves. Why do I do this again? Oh right, because I love it. Also sometimes when I watch a rider having slight issues- stopping, bad distances, or whatever it makes me anxious too. I think, well if they can’t make it look great, how will I do it? Do I even know what I’m doing or how to ride? It’s silly, but definitely psychological. Older Oats pix from Avalon: photo courtesy of Jodie Wright. We worked over the grid, building it up from poles, to x-rails, to an x-rail oxer. Kept it at two jumps only, and then built in a small course. Oats was very blahhhhhh about the grid at first, so we’d jump the x-rail or whatever, and then GALLOP around the arena, bring him back, and go through the grid again. Anything to keep that engine firing!! 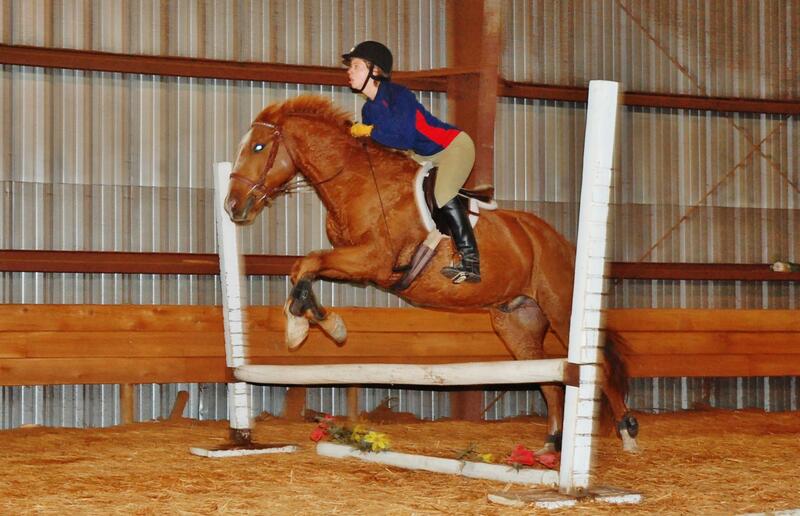 More older Oats pix from Avalon: photo courtesy of Jodie Wright. As much as I hate grids (and boy, do I!) they are teaching me some very valuable lessons about pace, not chasing (still do it though) and keeping the engine going and making corrections WELL ahead of the first x-rail. So we worked over the course, and funny enough we got short distances, one or two long distances and some of my patented crank-his-head-sideways to make a distance on a diagonal line (ooops…thought I’d gotten over most of that) but you know what? It was ALLLL good. It went really fast too, holy. 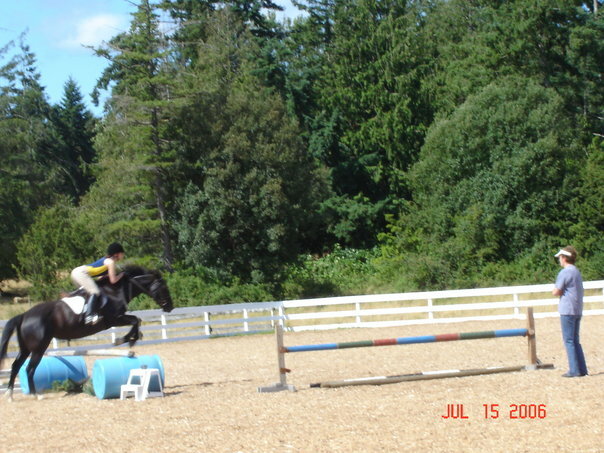 And slowly, bit by bit, those jumps that I deemed no way became the jumps we were doing with no problems. I was a bit surprised by his ‘jump’ stupidly-because hello- if you jump higher than x-rails, you get more of an effort…And these are not high jumps by any stretch of the imagination, we’re talking like 2’3” or close to it here, hahahah. We even did this crazy rollback type thingy to a skinny *that I literally NEVER got in straight to* was nooo problem. And even the small oxer in the grid got higher too- I didn’t even notice but it was a hole higher than what the previous rider had! Haha. Good: Pace was good, rhythm was improving, gridwork better. Staying in a comfort zone is probably the healthiest mentally I have ever jumped at. Better at letting hands go forward instead of throwing upper body. 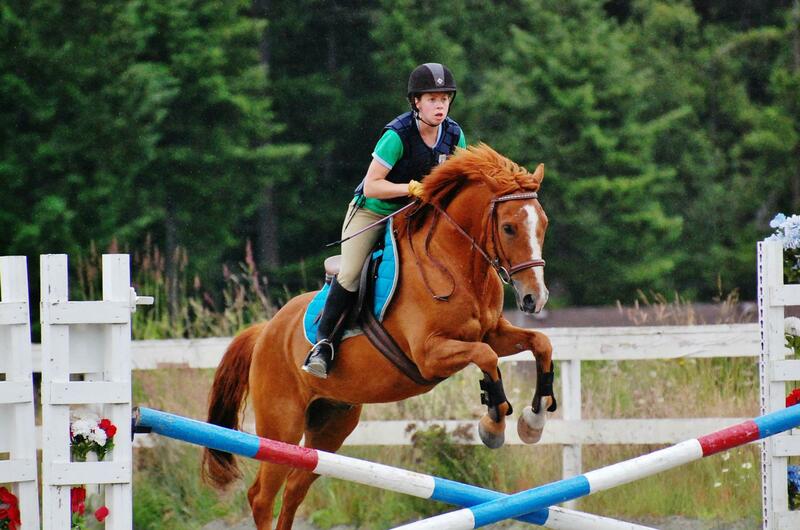 He was staying more interested and focused on the jumps when I got the pace nailed down. Bad: Still making him go in crooked. Grabbing back at the reins interrupts the rhythm, have to learn to trust him and just grab mane (he was perfect when I did). Need to land more on feet, when getting used to more of a ‘jump’ feeling. Need to focus on keeping a better track and not getting bumped out of my track when I get a surprise jump. Still had feelings of anxiety mixed with ‘no biggie’ feelings. Continue doing: Visualizing the jump lesson from Thursdays on my walk to work. Really focus on riding the correct ‘feel’ and if you get distracted, go back in your mind and do it again! Yeah, sentimental old me- lately I feel like I’ve been saying to people- hey stop with the mare-bashing, some of the NICEST horses I’ve had have been mares! (ok, so maybe I just leased them, but man, i loved those girls!). One such mare was Lucy, who is now a school horse with her owner Cathy Harrison, with the Harrison School of Horsemanship. I rode her when I was getting back into riding during university, after having take a year or so off. I started riding at Bear Hill with Cathy when it was still operating. 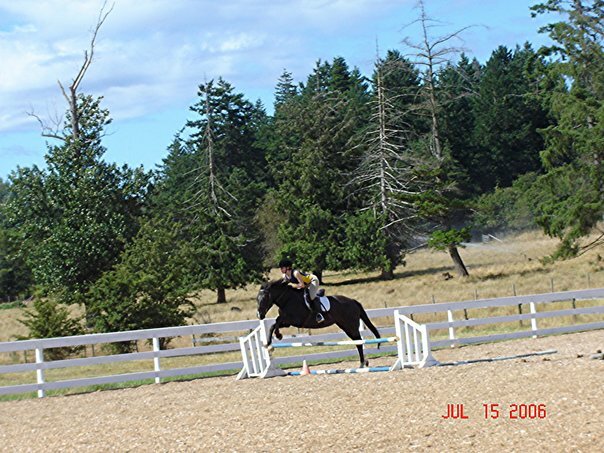 Lucy was very good to me, as an adult coming back after a year or more off, and we took to jumping together really well. I would have loved to buy her- I recall she was going for $4,500 but I couldn’t afford a horse at the time (broke university student!) 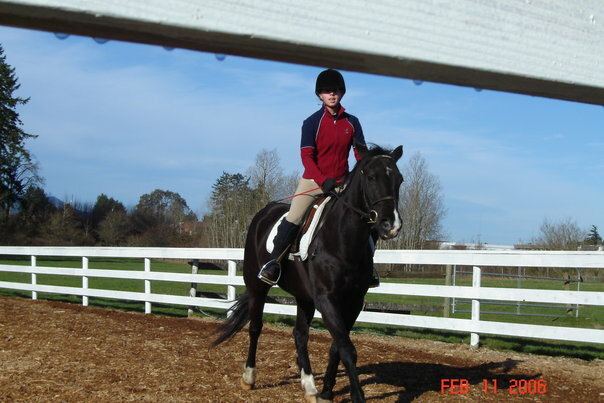 and felt really glad that she was going with her current trainer to be her school horse. I remember snowy days, misty days, cold days, rainy days. All good days when I was getting back in the saddle. Without further ado- photos of Lucy- loved that girl! Misty day- hard to believe this was almost 10 years ago? I have a painting of this one!